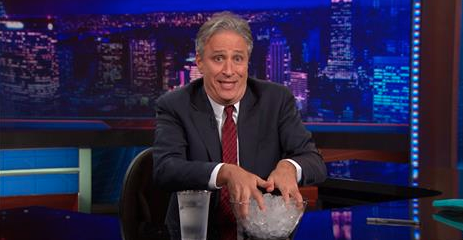 Lately, it seems like I've been posting a lot of John Stewart clips on Facebook. It's been a good few weeks if you want a good laugh at the apparent lunacy of the Republicans and their cronies at Fox News, what with John Holdren's testimony to the House Committee on Science, Space, and Technology, the Ebola crisis (which apparently is Obama's fault, along with war, famine, and death), and ISIL. Stewart's demolition of Rep. Lamar Smith's assertion, based on the behavior of the ice in his glass of water, that melting glaciers couldn't cause sea level rises, was particularly chucklesome. Unfortunately, when you stop and reflect on what's going on, it's not quite as amusing. The Republicans are slowly and carefully building a public narrative that questions the integrity of the scientific community and hence the level of trust that you can place on what we say. A recent review of American public attitudes in PNAS suggested that while Americans view scientists as competent, they are not entirely trusted. A particular source of concern seemed to be the dependence of scientists on grant funding, the implication being that they will say or do whatever they have to in order to get their hands on money. Seen in this light, Rep. Smith's ongoing investigation into the peer review system at NSF takes on a whole other dimension. It could be that, as Smith claims, he is just fulfilling his obligations as an elected public representative in the face of stonewalling from the agency, which is claiming (rightly) the need to maintain the confidentiality of the peer review process. But it's an inevitable truth that if you sling enough mud at something then eventually some of the mud starts to stick. If you look at the list of grants that Smith wants to review, there are a few patterns that spring out at you. There are the usual set of quirkily-titled social studies proposals (the Republicans have a long-standing abhorrence of NSF funding of this sort of research) and more than half the proposals are for work that takes place overseas (your taxpayer dollars being paid to 'furriners'). This plays into a narrative popular with a certain class of Republican voter, whereby (in their opinion) the Federal government squanders public funds on frivolous projects that do not directly benefit the American people. But there are also a fair number of grants on the list that relate to climate change. Eight of them, in fact. The interesting thing is that seven of these grants do not deal with gathering evidence of climate change. Instead, they are projects concerned with communicating with and educating people - especially children - about climate change and its impacts. So, for example, we have a film, a musical, a museum exhibit, and a program to develop cooperative educational partnerships, all focused on the issue of climate change. By now, I hope, you will have begun to see the story that is being shaped by the Republicans. "The scientific community is just another lobby organization. They benefit from a system - peer review - whereby they get to decide how your money gets spent without any oversight from your elected representatives. They choose to spend that money to further their own agenda of promoting the 'theory' that climate change is caused by human activities, corrupting the minds of our young people through educational materials and museum exhibits which, you, the taxpayer, are paying for. They criticize us for taking money from our friends in oil and coal, but they themselves are only interested in getting grant funds to pursue their own interests." In short, they can argue that the strongest possible reason for accepting the reality of climate change - that the overwhelming volume of scientific evidence and scientific opinion supports it - can be challenged because the system that generates and supports the research is flawed and because rather than being impartial, as the PNAS study suggests the American public wants us to be, we scientists have gone one step further and have become advocates for a particular point of view. It's a pretty effective strategy, because it aims for the root of the scientific process - peer review - and says that, much like evidence in a court of law, the case for climate change is fruit from a poisoned tree. It can't be trusted. At best, it makes us look like we are on a level playing field with lobbyists for the fossil fuel industry. If you work in a museum in the U.S., then this should bother you a great deal. Notice that one of the grants targeted for review is NSF DRL-0915778, "Hotspot California: Bringing Dioramas to Life Through Community Voices," a project at the Oakland Museum of California to develop an exhibit that (in the words of its abstract) will showcase five real places in California that exemplify high biological diversity and complex environmental issues. Innovative approaches to interpretation will emphasize personal connections to these places and infuse static dioramas with visualization technologies that illustrate environmental change over time. I haven't seen it, but my friend Pat Holroyd (who has) says that the exhibits "are really cool and have been transformative for that institution." So this is personal for us. This is our job, it's what we do and, as I argued in an earlier post, it's what we need to be doing more of if we are to advocate successfully for the ongoing relevance of museums and their collections to society. At the moment, we trade on public trust - that oft-quoted, much-valued feature of museums that makes us a valued resource for information. But if NSF's recent experience is anything to go by, that trust is likely to be the first thing that comes under attack. And we will come under attack, because museums are an effective mechanism for getting information about scientific research to people who might not otherwise be exposed to it. We currently say - and we should continue to say - that what we tell people is based on conclusions drawn from the overwhelming weight of scientific evidence; in many cases that evidence actually comes from the collections that we curate and the work of our own scientific staff. But once the integrity of our staff is called into question, you can easily imagine the voice of outraged conservatism - "I'm not having my kids go to some museum where activist staff fill their heads with propaganda about climate change." For many museums this is not a new phenomenon - those of you with long memories may recall the Enola Gay controversy at the Smithsonian's Air and Space Museum nearly twenty years ago. But in natural history, we're used to being seen as the cuddly place where kids go to learn about dinosaurs and pandas. True, museums have tackled - and continue to tackle - the issue of climate change. But as the weight of evidence and opinion turns towards the conclusion that the impact of our species on the planet's climate represents a major challenge for future generations, we are going to come under increasing pressure to moderate our message from those with a strong political and economic stake in promoting the opposing viewpoint. This is going to be a time for fearless leadership from the top of our institutions down, starting at Board level. So what do we make of the recent brouhaha regarding the presence of well-known "climate skeptic" David Koch on the Board of the American Museum of Natural History? There are those that say that Koch, as "one of the biggest funders of groups that deny or misrepresent climate science and biggest contributors to climate pollution" has no place in the leadership of an institution like AMNH. But as I look at the challenges facing us, I wonder whether it isn't exactly the opposite. If museums like AMNH can't accommodate someone with Koch's views on their boards without compromising their message, aren't we basically proving what the Lamar Smith's of this world would have people believe - that we have abandoned any semblance of impartiality in favor of outright advocacy? My - perhaps naive - belief is that if AMNH, or any other museum for that matter, has a strong, honest, principled stance on the content of its programs, it should be able to resist the attempts of any board member, however wealthy or powerful, to push those programs in directions that contradict the weight of evidence. It's better to have them at the table than to exclude them and prove Smith and his congressional allies right.